It was a late night with Margaret in the emergency vet hospital. We came home from work and Margaret was struggling with breathing and straining her neck and mouth. She had separated herself from the rest of the flock and was crouched in the corner of the barn. 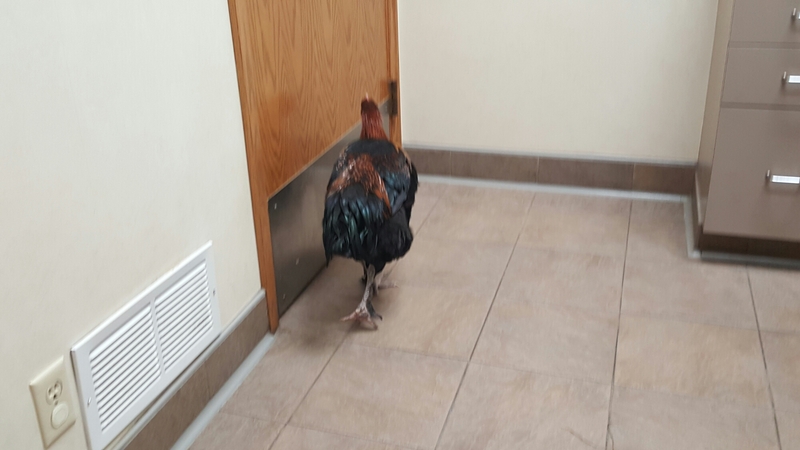 We did some quick checking on the Internet and communicating with some friends before deciding to head down to st. Paul for one of the only 24 hour animal hospital in the metro area for chickens. When I arrived there were several other animals- all cats ahead of me. My turn finally came 2 hours later. The lady next to me talked worridly about her cat for 2 hours staight. By the time the vet met with me, Margaret’s color was getting paler. They immediately gave her oxygen while I was given the options. Amidst waiting for the doctor and seeing Margaret in full lights I had a realization that Margaret was not a she but a he. After some google searching, I was pretty sure, which the doctor confirmed. After talking with the doctor, I said goodbye to Margaret and they put her down. Now I know I am a chicken fanatic- I am crying over another chicken. By 1 am. I drove Margaret’s remains to the University for an autopsy. We want to make sure there isn’t anything harmful to the rest of the flock. We will get an update soon. My head knows the cycle of life and has moved on but, boy, I am sure attached to this first round of chickens. Thank you, I am learning a lot in this first year of raising chixkens.